DreamWorks has acquired the rights to the life of the Rev. 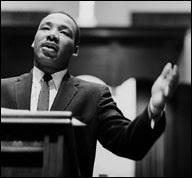 Dr. Martin Luther King Jr. and plans to bring the civil rights leader's life to the bigscreen, Variety reported. Steven Spielberg, Suzanne de Passe (former manager to Diana Ross and Jennifer Holliday as well as producer of “Lonesome Dove” and “The Jacksons: An American Dream”) and Madison Jones (the animated program “Our Friend, Martin) will produce. A King film has been a longtime dream for Spielberg and DreamWorks CEO and co-chairman Stacey Snider, who has been working feverishly on acquiring the rights since exiting Paramount Pictures and setting up a solo enterprise. King's son Dexter, who is chairman and CEO of the King Estate, has been embroiled in a legal tussle with his siblings Bernice King and Martin Luther King III over who controls the personal papers of their late mother, Coretta Scott King, among other things. Casting has not been announced... but, I gotta say - I can't wait to hear who they get.